In the ecommerce world, one of the smartest ways to improve ROI for marketing campaigns is to retarget customers who visited your website in the first place. These visitors are already in the market for the types of products that you sell, but how do you pull them back if they’ve dropped out of the checkout process? The most effective way to grab these customers is to target them based on where they dropped off. Luckily, Google lets you do exactly that: with the right analytics, you can set up retargeting campaigns based on checkout behaviour. At Littledata we’ve helped online stores in over 50 countries to improve marketing ROI using ecommerce tracking. In this post I share three simple steps you can take to improve your AdWords retargeting based on ecommerce checkout behaviour. Enhance Ecommerce tracking has been available from Google Analytics for a couple of years now. If you’re already using this Google Analytics feature, good for you! Having product data means you can take advantage of this and create Audiences that then can be shared with AdWords (and other platforms). In order to improve AdWords retargeting using checkout steps, you must have checkout tracking and Enhanced Ecommerce enabled in Google Analytics. Then you can follow this checklist to set up accurate product tracking that can be used for Audiences in AdWords. At this point, it’s important to mention that there are a lot of elements to Enhanced Ecommerce tracking and each part needs to be set up separately. For example, you will not automatically be tracking product categories, listings and details. If you’re not sure how to implement the full extent of Enhanced Ecommerce, we’re here to help. If you’re using the Shopify platform, you’re in luck, as our Shopify reporting app‘s audit feature checks for accurate product and checkout-step tracking, and automatically assists with setting these up for you. 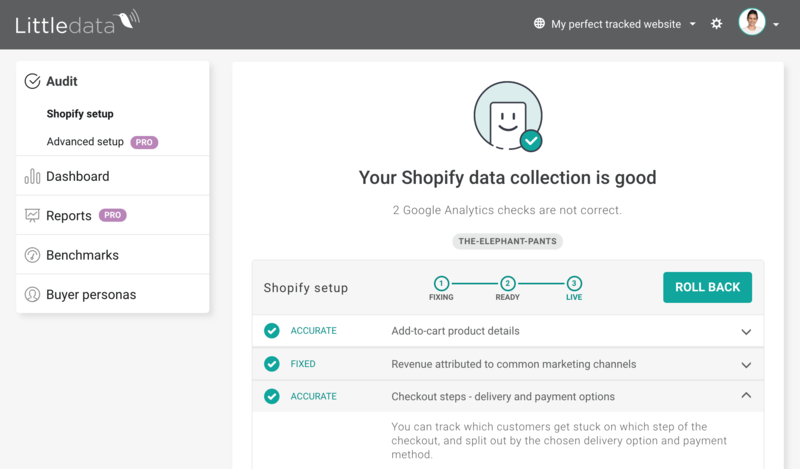 The app works directly with the Google Analytics setup for your Shopify store, so you don’t have to deal with Shopify’s native reporting, which doesn’t let you see how users are progressing through the checkout process. Shopping cart abandonment is the most frequent complaint we hear from ecommerce marketers. Why does someone add products to their shopping cart and then just abandon it completely? This isn’t common in brick-and-mortar stores, so why does it happen so often online? Remember that online shoppers don’t want to leave those things behind. They were attracted to those products and have expressed the desire to buy. But with a bad checkout flow, too much information or too little, they’ll fly away and leave behind only unloved products with high shipping costs or under-promoted benefits. One of the best Enhanced Ecommerce use cases is the Checkout Behaviour report. This is essentially a Shopping Cart Abandonment report, showing weaknesses in your checkout process and where to invest your time and money to convince users that have added-to-cart to go ahead and complete a purchase. Are you charging customers too much for shipping? You can’t really change that cost for all carts (we know that shipping costs are significant) but you could, for example, offer free shipping to shoppers with items in their cart over some profitability margin. Retargeting those users in Google AdWords is an effective way to show them that you’re ready to reward them for making large purchases from your online store. Are you limiting yourself to too few territories? Put your analysts to work to find out where customers that leave the purchase flow want their goods to be delivered. Can you extend your logistical capabilities, or do you have a brick-and-mortar store nearby where you can direct these shoppers? Use AdWords retargeting to let them know. Of course, Google Analytics’ native reports aren’t for everyone. If you find them confusing or haven’t worked extensively with enhanced ecommerce data, check out Littledata’s report packs. These automated reports are an easy but comprehensive way to read and interpret ecommerce data without any hassle. 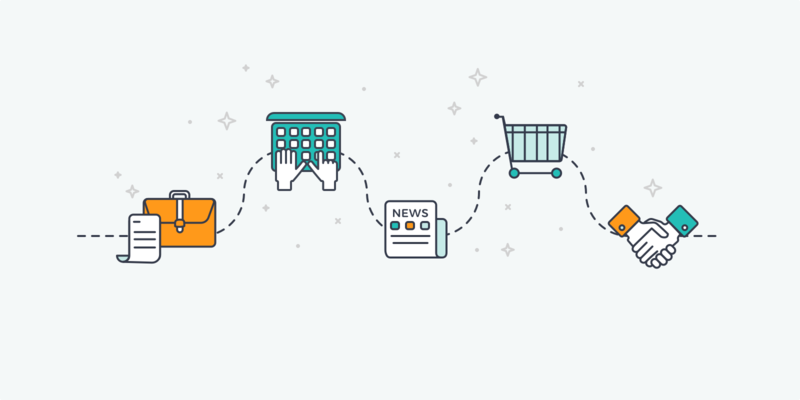 For the purposes of tracking checkout steps to improve retargeting, I’d recommend our Ecommerce behaviour pack, which includes reports on shopping behaviour by marketing channel and checkout steps. How do you retarget users in AdWords based on Google Analytics data? Fear not, my brave colleagues! If you’ve made it to this step, you shouldn’t have any trouble creating powerful retargeting campaigns. First you’ll need to create a new Audience. In your Google Analytics Admin, find Audience Definitions in the middle of the screen near the bottom. You’ll then need to set a time period. Think about your specific business and how far back you want to go with the search. Once you’re happy with your selection, pick which Google AdWords account you’ll want to link to this new Audience. That’s it! You’re now ready to run PPC promotions to a buy-ready audience that would otherwise have disappeared. I hope you’ve enjoyed this quick guide. Please drop me a line below and let me know how you use checkout steps in relation to AdWords. I always love to hear how other specialists in the field combine platforms to create perfect marketing.